When I saw the OPI Mariah Carey Christmas Collection 2013 I was not very impressed. Too many too similar polishes. But when I took a closer look at them (that happened to coincide with a 30%discount at Kicks) I actually found that most of them are really beautiful. I decided to buy some of them. I have tried two of them so far, Underneath the Mistletoe and Make Him Mine. Underneath the Mistletoe is a quite deep red with small silver and red glitter. The base is jelly-ish but two coats was good enough for me since I planned to stamp on it. Might use three coats without stamping. 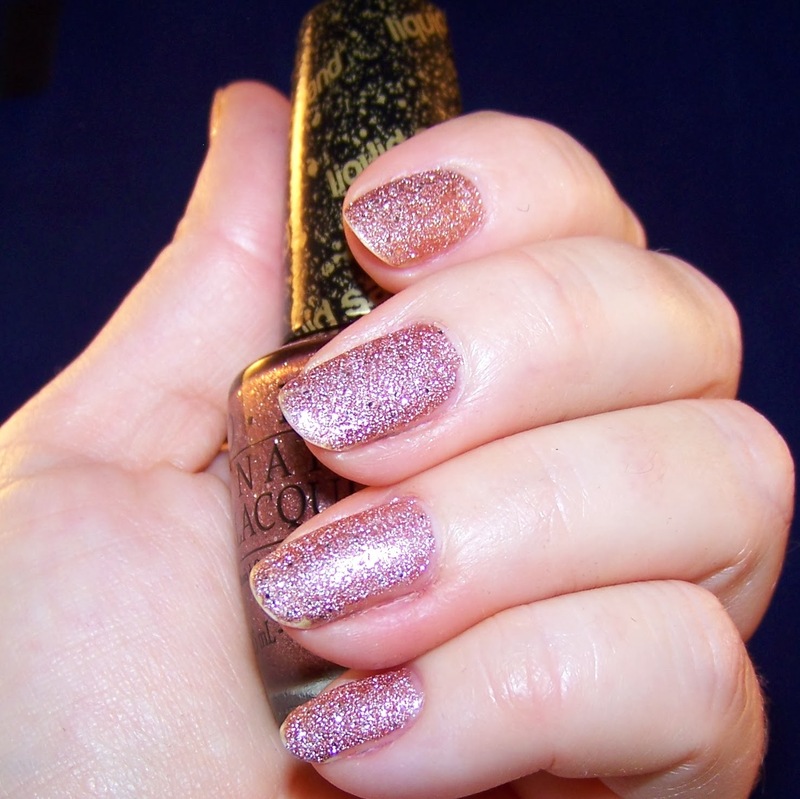 The result is a bit less sparkly than the bottle promises, but nevertheless I think it is a beautiful polish. The glitter seems to sparkle from a depth, in the right light it is stunning! 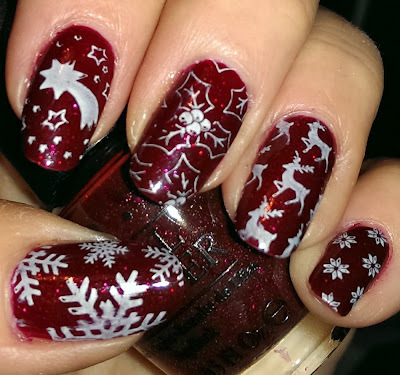 I had this on for the annual Christmas Smorgasbord this Saturday, stamped with Konad White Pearl, using plate from MoYou London Christmas Collection - 03. Next in line is Make Him Mine, one of the Liquid Sand polishes in this collection. The colour is somewhere in between rosy and champagne and it is really sparkly. Easy to apply, one coat is sufficient, and it dries pretty fast. Good for a quick mani when time is short. I still applied two coats, even more beautiful! I could not resist stamping on this too. I love stamped full patterns on structure polish! For this I used a brown polish from Vylet and the MoYou London plate Sailor Collection - 07.